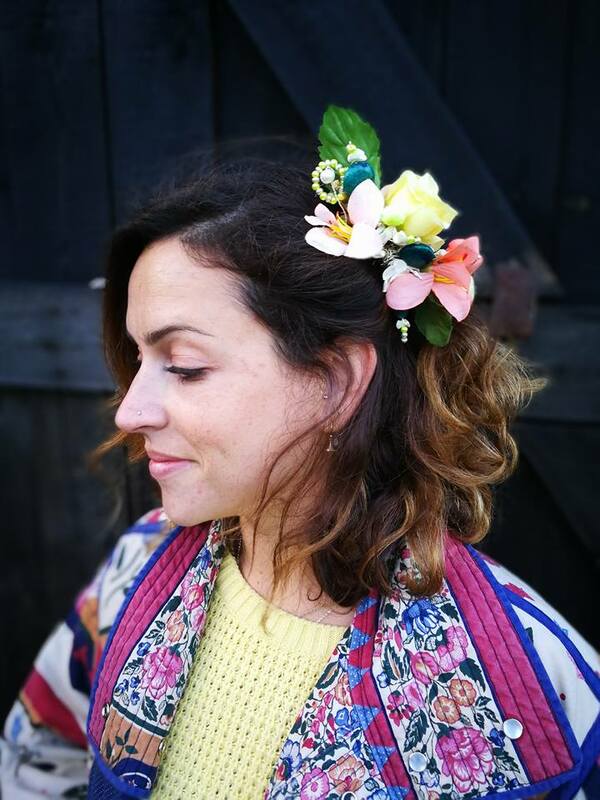 New & Exciting Cultural Embroidery Workshops with Titania fisher Millinery! At Designer Makers 21 Craft Studios in Diss and Art Anteros in Norwich I've started up monthly cultural embroidery workshops inspired by different cultures embroidery/textile techniques around the world. They are Suitable for all sewing abilities, as well as older children. Please get in touch tarnafisher@yahoo.co.uk if you would like to join a workshop. A wonderful Double Spread in the Norfolk Magazine! Alongside Suzanne Fossey @fosseyimages phtography we created a circus themed phototshoot with my new collection of work and we actually got to photograph it at the hippodrome circus in Great Yarmouth, it was an incredible venue with lots of history! I was really pleased with the images and from people getting in touch to commission me from seeing the Norfolk Magazine! 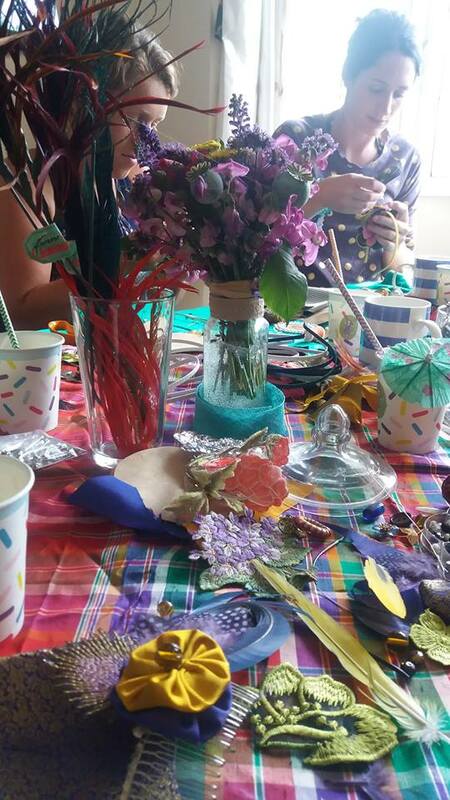 This was such a great venue to hold a hen party - the ladies made incredible hair combs from vintage brooches, buttons, beads and flowers- i was so impressed at the creative array of combs! I taught the Hen Party how to make Creative Corsage hairpieces using fabric, embroidery, buttons, feathers and beads- they then all wore the pieces at the colourful wedding of Alice and Rick! I took part in a fantastic exhibition called bee inspired that featured a combination of craft disciplines all being inspired by bee's and there environments. 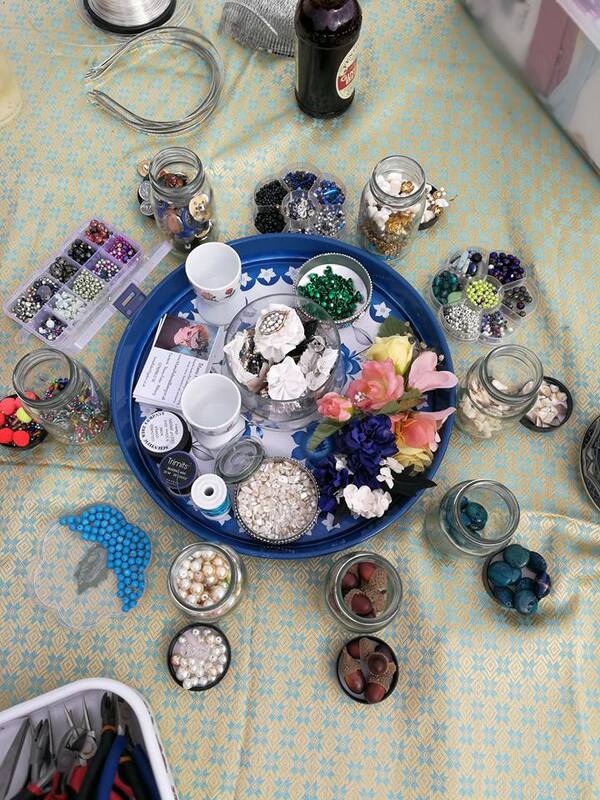 I enjoyed the theme greatly and created many mixed media pieces including beadwork, embroidery and millinery. The Show will be touring this year throughout norfolk! A Sunny North Norfolk hen party! I was asked to do a crafty hen do party for francis and her 11 friends, we had a lovley time and everyone made something really nice to wear at the wedding, everyone's personality's came out in their hair pieces which was interesting! Please if interested in booking a hen do with me , please see more photographs of the hen do on my facebook page- Titania Fisher Millinery! Inspired by Mary Antoinette i produced a collection of headdresses that were then used for a Vintage Fashion show that was held at Norwich Puppet Theatre in March, these are some of the photographs of my work on the models with big dramatic bee hive hair! A few months ago I was asked to create a collection of headpieces with matching jewelry for a photoshoot with laura huges hair and paula daynes makeup for an alternative bridal shoot. This is my space in the exhibition featured below..with hardly any planning i love the way the display has taken shape! with the butterfly wing piece and hat pin hanging in mid-air..creating movement and an ethereal element...please pop down to see the real thing! you are also available to buy my work direct from this exhibition! This is a writeup about my work in the Norwich resident magazine November issue! A redhatters tea party workshop! I taught 6 red hatter ladies how to create silk flower and feather fascinators last week! I enjoyed it lots and they made some beautiful pieces using red and purple silksm sequin trims, crystals and sinamay. They have asked me to do more workshops for them at a later date in creative corsages and tiara making! This Wednesday myself, Merial garland makeup and JMA photography got together to create a wonderful series of photographs showcasing the new collection of fascinators and tiaras that i have created. We were helped enormously with this by our two beautiful models Lauren and Lilly! A Green silk art nouveau style paisley shaped disc with hanging beadwork pieces and crystal detailing.. I have just finished this commissioned piece that im very pleased with. Inspired by a peacock feather the bespoke piece is completely hand beaded in silver, black and grey beads and iridescent blue sequins stitched into suede. The piece was the attatched onto a double band. I look forward to seeing photos of it on! I love the lacework and beadwork that this london based company has used to create this mask. This is a stunning image of Lauren wearing one of my fascinators from a shoot last week, she will be modelling for me again for the next collection that is complete and ready for photographing next week!